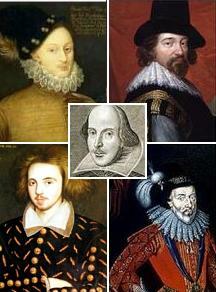 Shakespeare Authorship Question / Who REALLY Wrote Shakespeare? The answer to the Shakespeare Authorship Question is not an illiterate townsman from Stratford. That’s silly, really. There are much better candidates. There are so many of them, in fact, and so many great arguments for different parts of the canon, that a multiple-authorship theory is the only reasonable conclusion. Shakespeare’s plays and poems are works of majesty and beauty. However, the question of who actually wrote them is a mystery that has lasted for centuries! There are so many good candidates, in fact, that a multiple-author hypothesis is the only one that can possibly be viable. But of all the candidates, the man from Stratford is the least — and the worst. Let me put it this way: If writing was a crime, we would be outraged that the man from Stratford was charged with it, much less convicted of it. And that’s just writing. Any kind of writing. Never mind authoring works of such great beauty! Before long, I expect that you will come to understand and agree. By the end of this introductory section, I suspect that you will have begun to question the matter. By the end of Part I, I suspect that you will completely set aside the notion that “Stratford” was the author. That fact is that we have historical evidence for every single writer of the period. All of them! Except one. We have zero evidence that the supposed author of the works in the English language could even write! That’s right. Zero evidence. There is not so much as a grocery list written by the man from Stratford, nor even a letter, much less a manuscript. There are no letters to him, or letters about him, either. Of course, we have no historical evidence that Mark Twain was a writer, either, other than his name on the title page of published works — which, by the way, is the only evidence there is for “Shakespeare”. But we know that “Mark Twain” was a pseudonym. And we know that Samuel Clemens was the author (for whom there is a plethora of historical evidence). Get the picture? In the face of such realities, only a congenital idiot can continue to believe (after an unbiased examination) that Stratford is the author — or worse, that there is no question in the matter. In short, the notion that the Stratfordian money-lender wrote the Shakespeare canon is patently absurd. Multiple authors, singly or in combination, make the best candidates. It is there that we need to look for an answer to the Shakespeare Authorship Question. The laughable notion that an illiterate money-lender from Stratford is the author of the works is dispensed with in Part I. That section also destroys the primary argument (argument, mind you — not evidence) that has been advanced for his candidacy. But it is worth noting in passing that at no time did he ever claim to be the author. Nor did any of his family. In his lifetime, neither did any of his neighbors or indeed, anyone in the town of Stratford. The claim was only made 100 years after his death, by people who had no association with the case. But if Stratford didn’t write the poems and plays, it raises the question of who did. And why on earth has it been kept secret for 400 years? The goal of this section is provide preliminary answers for those questions. Subsequent sections will dive into the subjects in detail. In reality, the question comes down to why it was kept secret for the first 100 years — because it was not until 100 years after his death that Stratford was proclaimed the author! Once the claim was made, the assertion went unchallenged during the next couple of hundred years for the simple reason that standards of historical scholarship had yet to be established, there was little to go on for any authors of the period, and it was difficult to share what knowledge there was. When historical evidence of the period did begin to surface, however, and when it became easier to share (first, with less expensive printing processes and later with the Internet), the lack of evidence for Stratford became noticeable. And it was noticed — by many, as recorded in Part I. The fact is that we have historical evidence for every writer of the period — most of whom you have never heard of. Except one. We have no evidence at all for “Shakespeare”. But by then, there was a huge, established society (The Folger Society) whose lucrative business depended on preserving that legacy. It was so lucrative, in fact, that they were able to endow “chairs” (department heads), as well as entire departments and fellowships all across Academia — and they were able to threaten anyone who didn’t toe the line with a loss funding! Those facts explain the secrecy for the last 300 years. But why all the secrecy for the first 100 years? To understand, let’s delve into Elizabethan society for a bit, to establish some context. To understand the secrecy, we have to understand that in Elizabethan England, the church and the law were still one and the same. There was no “separation of church of state”. That idea would not appear until hundreds of years later. This was a time when the inquisition was empowered to “save men’s souls” by using horrible instruments of torture — and a time when “moral depravity” could cost you not only your own life, but could consign your entire family and future lineage to poverty and neglect — not to mention your place in heaven, which was a fixed tenet of indoctrination throughout your life. At this time in history there was, as now, a double standard with respect to men’s and women’s morality. If men sired children out of wedlock, they were virile and manly. They might not be able to claim parenthood openly, but they could be proud of their achievement. If women did so, however, they were evil and could be punished. What about marriage, then? There were problems there, as well. For one thing, a woman of her station could only marry someone of equal or higher station, which considerably narrowed the field of candidates (leaving pretty much no one who was really suitable). So she never had the option of marrying someone she really loved. Nor, for that matter, could she be entirely certain that they loved her, rather than her station — unless they agreed to anonymity. Perhaps more importantly, becoming married to anyone would have precluded her own lover(s). At that point, her marriage partner would become King, and she would become a mere vessel for the King’s heirs — she, who was smarter by far than most anyone alive at the time. At this time in history, homosexuality was also a “crime against nature”. And it was a crime against the church, which would punish the perpetrator savagely, along with their entire family. This factoid becomes important in the context of Shakespeare’s poetry. Edward De Vere is the best and most likely candidate for authorship, but again we return to the question of secrecy. One possible interpretation of the published sonnets is that they were written for a homosexual lover, Henry Wriothesley. If so, that fact would have been sufficient reason for the initial secrecy, since the poems pre-date the plays by a good 10 years or more. Another serious crime of the day was a pretense of royalty. To be a “pretender” to the throne was to create a potential challenge to royal authority, and to embolden those who might seek to replace the current occupant with someone more amenable to their plans. Still, if the clues added up to a plausible claim of nobility, and if a familial connection was implicit in the verse, then an admission of authorship could be tantamount to a death sentence for both the author and his son. The clues by themselves may point ambiguously in a variety of directions, but once authorship was claimed, those clues would become proof, and that proof could very well get the author killed! As important as the criminal code is to understanding Elizabethan society, it is equally important to understand their pastimes. We all like word-play, to a degree. But in Elizabethan times, the English language was just beginning to come into its own. As a polyglot of multiple other other languages, it was just beginning to form its own identity — and at the same time, the rich vocabulary derived from so many sources created tremendous opportunities for word play! In fact, the ability to skillfully manipulate the language was akin to plumage. This was a time when men and women dressed in huge, ornate costumes. It was also a time when flowery language and courtly love were at the forefront of social pastimes. Word play included double entendres, multi-lingual puns, hidden meanings, anagrams, encoded phrases (“Easy Running In Circles” = “Eric”), and other cryptic clues, where the “clue” consists of a phrase that needs to be properly interpreted to discern the answer — and where the phrase itself contains clues about how it should be read. For example, if an Elizabethan lady received an anonymous poem “by the first man repeated on a twist”, she would be delighted to figure out that “first man” meant “Adam”, that “repeated” meant a multiple thereof (“Adams”), and that adding “on” to the end created “Adamson” — especially if your name happened to be Adamson, and you were her lover! In that (admittedly contrived) phrase, “a twist” is the clue that says you need to re-read the original sentence and re-think it. That sort of puzzle is still given at the back of the The Nation magazine, and is still fairly popular in England. But in Elizabethan England, it was all the rage, most especially in elite society. And as you’ll find when you investigate the authorship question, word play abounds in the analyses! This was a day when the “legal houses” were often pretty much a collection of graduate students — a time when they and others put on “masques” and plays as a co-operative effort. A masque was a “a form of amateur dramatic entertainment, popular among the nobility in 16th- and 17th-century England, which consisted of dancing and acting performed by masked players” (Google Dictionary). It could also include pantomine and song, according to Dictionary.com. Plays were more extensive, with a plot and multiple acts, but they were still put on by a group. Planning and rehearsing would occupy many an evening, and delivering them would provide entertainment for others. It is important to note, too, that plays were more organic than they generally are today. There wasn’t a single author who wrote all the lines, to be memorized and delivered by others. Instead, the script was more of an outline. Details were fleshed out as the play was rehearsed. Players “learned their lines” by memorizing the things that sounded good during their run throughs. Then too, when a new actor was brought in for another performance years later, whole new blocks of material might appear in the play, as the new player had something they wanted to say! There was one letter of invitation that said, “We have the man, Shakespeare, with us”. (As I recall, it was a letter to Elizabeth or someone highly placed in her reign, inviting them to visit the Pembroke estate.) Now, if it was any of the well-known candidates, it would not have been necessary to use the author’s alias. It would have been necessary either a) For Marlowe, who was supposed to be dead or b) Someone who was ostracized from court that the Queen might want still want to see (such as De Vere). Having a “Shakespeare” buried anywhere, however, was probably the key has kept the charade in place for so long. After all, if you did a historical investigation into Mark Twain, you might find it suspicious that he never died! That fact alone could lead you to uncover the true author, Samuel Clemens. But with a body safely buried, there was one less reason for suspicion. During the reign of James I, it would have been even more dangerous to make a claim to royalty as an heir of Elizabeth. At this point, the nome de plume had been used by the author of the sonnets and by the authors of the plays. It may even have been the case that Christofer Marlowe had been given the name to buried under, in church. With so many referred to by the one name, it would have been a difficult story to tell — and the fallout from any one admission may well have had many unintended consequences for others. In all then, it was best to let the matter lie. And it did lie, quietly, for 100 years, until the man from Stratford was posthumously elected to the position — something which could only have been done at that time, when so little was actually known, and when information was so difficult to share. At the same time, there are other candidates who have clearly had a hand in the plays, if nothing else. Alexander Waugh’s magnificent series of 3 talks, recorded on YouTube. His other talks are worth a listen, as well. Great analysis that suggest Marlowe as the author of Venus and Adonis, plus Lucrece. Good luck with your writing career! Take a look at my WordPress Lessons Learned and other WordPress pages for my experiences, good and bad. In general, I’d say the site is a lot better for having it, but at the same time it is a hell of a lot of work! A ton of work to set up. Not too bad to maintain, once in place. Thanks. I like your site, too. Why is there no way to contact you on it? Hello there, You’ve performed a fantastic job. I will certainly digg it and individually recommend to my friends. I am sure they will be benefited from this site. I was very pleased to uncover this web site. I wanted to thank you for your time just for this wonderful read!! I definitely liked every little bit of it and i also have you saved as a favorite to check out new things on your site.